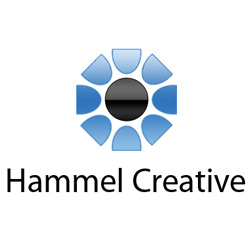 Hammel Creative Media is a full service Multimedia/Marketing/Design Agency. We provide affordable, quality services in web, graphic, audio and video. We give attention to detail, offer guidance in creating, work with clients to meet any and all specifications possible, produce what we promise. We back up what we deliver by offering Technical Support, Webmaster Duties, Web Hosting, etc. Our degreed professionals have more than 20 years experience. Professionalism and time-deadline material is of utmost importance, along with the desired finished product. We can start a web site from scratch, rebuild existing pages, offer SEO (search engine optimization), or add Graphics and make your site more user friendly. We can create Brochures, Event Programs, Business Cards, Marketing Signs, Print Ads, Fliers and more. We have created T.V. Commercials, Voice-Overs for Radio, Announcements, Commercials and Message-On-Hold Services. *Pricing is based upon varied services provided.